JUST over one year ago, three members of a NSW family died in a tragic accident while cleaning an empty water tank on a property near Gunning in southern NSW. Police attributed the deaths to carbon monoxide poisoning, caused by a build up of fumes inside the tank from a petrol pump being used to clean it. In January 2018, two brothers in a haulage business at Sarina in North Queensland were found dead at the bottom of a fibreglass tank used to cart dunder and molasses on a trailer. It is understood the two men were cleaning the residue in the tanks after unloading the day before. Workplace Health and Safety (WHSQ) is still investigating the incident. Long-serving farm safety advisor Jamie Cupples from Farmsafe Queensland says many farmers enter confined spaces without taking the minimum of precautions. “We are very concerned that farmers generally don’t consider confined space hazards well at all,” Mr Cupples said. Farm work has many examples of confined spaces, including grain silos, grain elevator pits, various types of tanks, trenches and vehicle service pits. Exposure to engine driven gases. Petrol engines and produce carbon monoxide; diesel engines will deprive the atmosphere of oxygen. 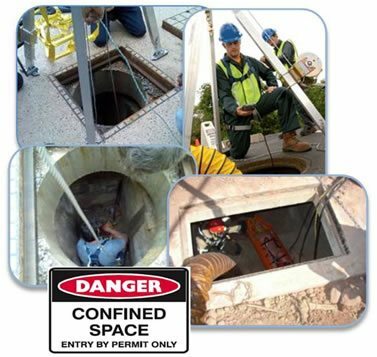 Confined Space entry is a regulated item under Workplace Health and Safety regulations. All States have similar legislation and penalty rates, including fines and potential jail time, that could apply to a business from a death or serious injury that results from a confined space entry. Queensland and the Australian Capital Territory have also enacted ‘Industrial Manslaughter’ legislation which makes it an offence for a person conducting a business or undertaking, or a senior officer, to negligently cause the death of a worker. Several other States are understood to be looking at similar legislation. More information on identifying and working in a confined space can be found on the Workplace Health and Safety Qld website at this link. However, many farmers either were not aware of their obligations under these rules, or ignored them. “The main issue for the industry is that farmers have been entering confined spaces for many years and getting away without injury,” Mr Cupples said. One of the most common confined space entry activities is entering and cleaning out grain silos. Mr Cupples said the process can be managed by some additional engineering controls and procedures, such as installing additional hatches on the bottom of silos that allow a person to hose the silo out from outside the silo, and installing auger lid openers, so workers don’t have to climb silos. Farmsafe Queensland also provides a Safe Work Instruction (SWI) document that farmers are encouraged to fill out as part of the safety system provided to clients. It requires farm owners/managers to undertake an assessment of the risks, ensure no work is undertaken in confined spaces until a safe system of work and confined space entry has been agreed to and approved in writing, and clear responsibilities are assigned, including a stand by person. Employees working in a confined space must be issued an entry permit, with no one allowed to enter a confined space without written authority. In Queensland alone, there have been 18 workers compensation claims accepted for workers injured due to chemical contact in a confined space since 2012. How to prevent a similar incident?